Forget boring baby announcements! 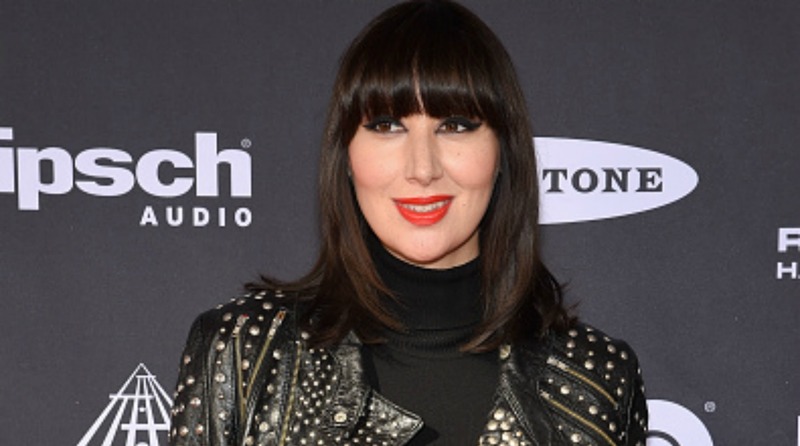 Yeah Yeah Yeahs’ singer Karen O announced her pregnancy by rocking an awesome outfit to show off her baby bump at the 30th Annual Rock and Roll Hall of Fame Induction Ceremony Show this past weekend. Now that’s how you rock a baby bump! Karen O (real name is Karen Lee Orzolek) is pregnant and expecting her first child with her husband, director Barnaby Clay. The 36-year-old lead singer of the Yeah Yeah Yeahs didn’t make a formal announcement but showed up at the Rock and Roll Hall of Fame Induction ceremony showing off her new pregnancy curves in a black, bump-hugging dress, studded leather jacket and leopard print boots. Karen O has yet to speak out on her pregnancy on her social media pages, but she did announce on her Instagram page that she was performing. “Lou is being inducted into the Rock’n’Roll hall of fame Patti is inducting him and me and@little_vampire will be there to sing a song in his honor,” she wrote. Karen O, who looks to be probably in her second trimester, had been spotted out recently wearing loose-fitting clothes before making the big pregnancy reveal this weekend. The singer and Clay, pictured here last year at the Oscars, have been married for four years. Game of Thrones star Lena Headey is pregnant: Who is the father?